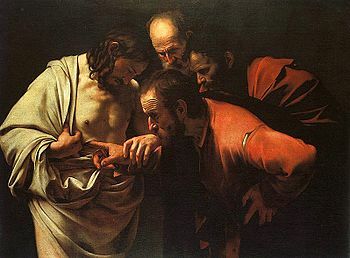 Thomas can be interpreted allegorically as symbolizing a certain tendency of our ego to be overly rationalistic and to insist that material facts and logical proofs are the only genuine basis for belief. This doubting disposition denies the experiential reality of other valid forms of knowledge, like intuition, insight, Conscience, inspiration and faith (pistis). Significantly, Thomas means ‘twin’ in Aramaic. Our ego is like one of a pair of twins, the other being a more intuitive, authentic, or higher self. The ego must learn to loosen its overly tight control. We must admit to ourselves that sometimes we have valid knowledge from extra-rational faculties. See if you can catch your own inner ‘doubting Thomas’ in action. For example, perhaps there is some article of Christian faith which you believe is true, but which your rational mind doubts or about which complains that logical proof is lacking. Your rational mind says, “You claim to believe this thing by ‘faith’. But what is this ‘faith’? How can it be seen, touched? How can it be proven to exist at all, much less be demonstrated to be reliable?” But despite this, the part of your mind responsible for conviction, for deciding “do I or do I not genuinely believe this to be true?” has the conviction. And by conviction we mean the same kind of ‘belief-in-the-trueness-of’ that a closely reasoned argument supplies. Consider the logical syllogism (1) if A then B, (2) A is true, (3) therefore B is true. If we know propositions (1) and (2) are both true, then we believe with absolute certainty that the conclusion (3) is true. That feeling of certainty is what is meant by conviction. 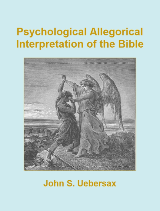 I am merely suggesting that, if one examines ones thoughts closely, one may detect cases where one has the strong conviction of some article of faith, and that this conviction or convincedness is essentially the same as what is felt for a conclusion that is proven by explicit logic, as in the above example. But the conviction produced by faith is such that it is not accompanied by awareness of a rational argument that proves, in a logical sense, the belief. Obviously not all forms of ‘unreasoned’ belief are of this character. It is possible to believe something on mere superstition, because it is flattering, or because of wishful thinking. Religious beliefs based on these things are not genuine faith, even though an ignorant person — namely one who does not know what true faith is — may claim otherwise. Atheist writers find ample ammunition from such examples with which to discredit religion. True faith, however, is not like these other things. It is characterized by genuine conviction; these other cases produce, at best, a shallow delusion or pretense of conviction.